WhiteCloud Software Ltd. announced the release of version 4.2.5 of EAComposer. An innovative and simple-to-use enterprise architecture tool used it to manage your IT landscape and technology portfolio. Delivered as a pure SaaS product: cloud hosted with a subscription based license model. Release 4.2.5 is a minor release and not part of the major releases on our published roadmap. The releases included both adding more content to EAComposer as well as existing feature improvements. EAComposer has always been a very flexible and configurable solution and in this release we are leveraging the EAComposer platform and providing more out-of-the-box content & configurations to further accelerate your adoption and usage of the product. - Improved Metamodel: Originally EAComposer came with a close version of the TOGAF metamodel however with this release we are moving towards a different metamodel, more practical and over-coming some of TOGAF's limitations. Of course you still have complete flexibility on tailoring the metamodel to your needs but we believe our updated metamodel will give you a better & easier starting point. - New Business Capabilities and Functions model: Most often technology components like applications are linked to the business capabilities and functions they support. Going forward EAComposer will include a default Capabilities and Functions model so you can immediately start linking your technologies into this. The default model is not industry specific and expected is that you would expand and tailor this model to your specific industry. In coming releases EAComposer will also start providing industry specific models. 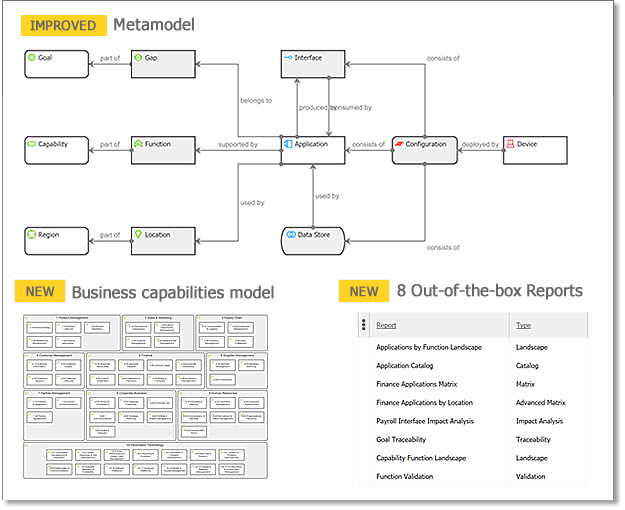 - New Default Reports: Leveraging the updated Metamodel we are now including 8 default reports for the most common insights different organizations are typically looking for. Just add your content into the architecture portfolio and insights are being delivered.